Herbs, perennial, stoloniferous; stolons soft, spongy, flexible when dried, 2-8(-15) cm, bearing tubers (3-)6-11 mm diam. Culms trigonous, 15-60 (-100) cm × 0.6-3.4 mm, glabrous. Leaves 3-7, flat to V-shaped or flanged V-shaped, (6-)20-40(-80) cm × 2-4 (-6.5) mm. Inflorescences: spikes broadly ellipsoid to ovoid or hemispheric, (12-)18-30 × (12-)18-35 mm; rachis 4-17 mm; rays 4-10, (0.3-)2-12 cm; bracts (3-)4-5(-7), ± horizontal to ascending at 45(-75)°, V-shaped to flanged V-shaped, (1.5-)5-30 cm × 0.5-4 mm; rachilla persistent, wings hyaline, 0.3-0.5 mm wide. Spikelets (3-)10-20(-28), divaricate or ascending, yellowish brown to dark brown, linear to linear-lanceoloid, compressed-quadrangular, (5-)10-20(-55) × (1.2-)1.4-2(-3) mm; floral scales persistent, 6-34, spreading or appressed, ovate-lanceolate, laterally 7-9-ribbed, laterally yellowish brown to dark brown medially brownish, reddish, or greenish, ovate, or ovate-deltate, medially 3-ribbed, 1.8-2.7(-3.4) × (1-)1.5-1.8(-2.4) mm, apex acute or sub-acute. Flowers: anthers (1-)1.2-1.5(-2.1) mm; styles (0.7-)1-1.2(-2.2) mm; stigmas (1.2-)1.8-2.3(-4) mm. Achenes (seldom maturing) brown, sessile, ellipsoid, (1.1-)1.3-1.5(-1.6) × 0.3-0.6(-0.8) mm, apex obtuse, surfaces puncticulate. Cyperus esculentus is a widespread and polymorphic species. 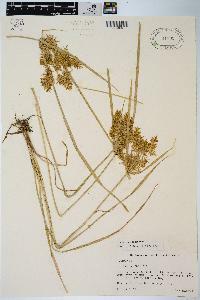 Although seven varieties have been recognized (G. Kükenthal (1935-1936), recent studies based primarily on spikelet features provided support for four varieties (P. Schippers et al. 1995). 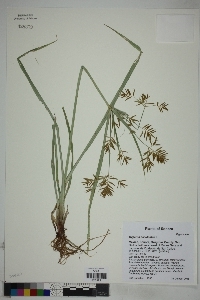 Cyperus esculentus var. esculentus is restricted to the Old World. 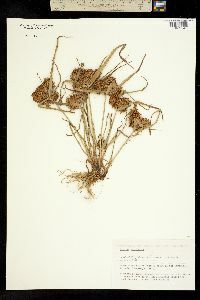 Perennial herb with slender rhizomes and runners 10 cm - 0.7 m tall Leaves: three to seven, basal, alternate, 20 - 40 cm long, 2 - 8 mm wide, flat or V-shaped in cross-section, linear, parallel-veined, keeled beneath, with a sheathing base that encloses the stem. Inflorescence: consisting of terminal spikes, subtended by spirally arranged leafy bracts. Bracts four to five, more or less horizontal to ascending, unequal, 5 - 30 cm long, 0.5 - 4 mm wide, V-shaped in cross-section. Rays (branches of inflorescence) four to ten, to 12 cm long. Spikes 1.5 - 3 cm long, 1.5 - 3.5 cm long, broadly ellipsoid to egg-shaped or hemispheric, consisting of ten to twenty spikelets. Flowers: minute, in the axil of a floral scale, lacking sepals and petals. Stamens exserted. Anthers 1 - 2 mm long. Pistil one. Style to 2 mm long. Stigma to over 2.5 mm long. Fruit: a one-seeded achene, stalkless, brown, about 1.5 mm long and 0.5 mm wide, oblong with a rounded apex, unequally three-angled, tiny-dotted, often not maturing. Seed with a thin, non-adherent wall. Culm: stout, 10 cm - 0.7 m long, 0.5 - 3.5 mm wide, triangular in cross-section, solid. Spikelets: wide diverging or ascending, 1 - 4 cm long, 1.5 - 3 mm wide, linear to linear lance-shaped, compressed four-angled, subtended by two small bracts, with six to thirty-four floral scales. Scales appressed or spreading, brownish or reddish or greenish down the middle, yellowish brown to dark brown along the sides, 2 - 3.5 mm long, 2 - 2.5 mm wide, egg- lance-shaped with a more or less pointed apex, seven- to nine-ribbed, lowest one empty. Habitat and ecology: Frequent in moist, fertile soil, often in cultivated areas. 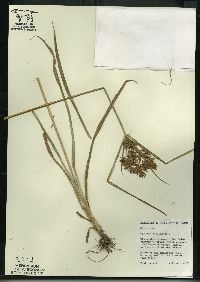 Etymology: Cyperus is the ancient Greek word for sedge. Esculentus means edible. Sweet-scented perennial with numerous slender rhizomes ending in small tubers; stems stout, triquetrous, 1-7 dm, smooth; lvs basally disposed, elongate, 3-8 mm wide; at least the lower invol bracts surpassing the infl; rays usually several, to 7 cm but more often not surpassing the sessile spikes, often again branched at the top; prophyll obliquely truncate or prolonged 1-3 mm beyond the orifice; spikes numerous in short-cylindric spikes, slender, 0.5-5 cm, only 1-2 mm wide, with 8-30+ fls; scales yellow-brown, (2-)2.5-3(-3.5) mm, thin, scarcely keeled, ovate, acute, conspicuously 7-9-nerved; rachilla persistent, narrowly hyaline-winged; achenes oblong, unequally trigonous, 1.3-2 mm, tan to golden-brown; 2n=108. Damp or wet soil, sometimes a weed; widespread in trop. and temp. (but not cold-temp.) regions, and nearly throughout our range.